Did I scare you? No? At my house we don’t dig the scary Halloween thing. If that’s your thing, right on! But over here we get jumpy when a light bulb flickers, so ghosts and ghouls with blood and guts would make me jump out of my skin. Eek! 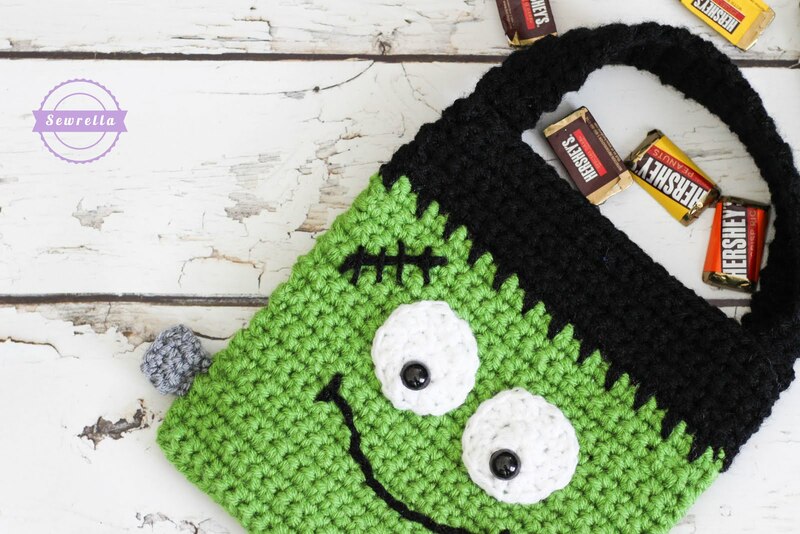 So because over here we are all about the friendly frights, here is a cute monster for your little ones to gather candy in. A cute Frankenstein friend with a sweet smile is just the perfect thing! 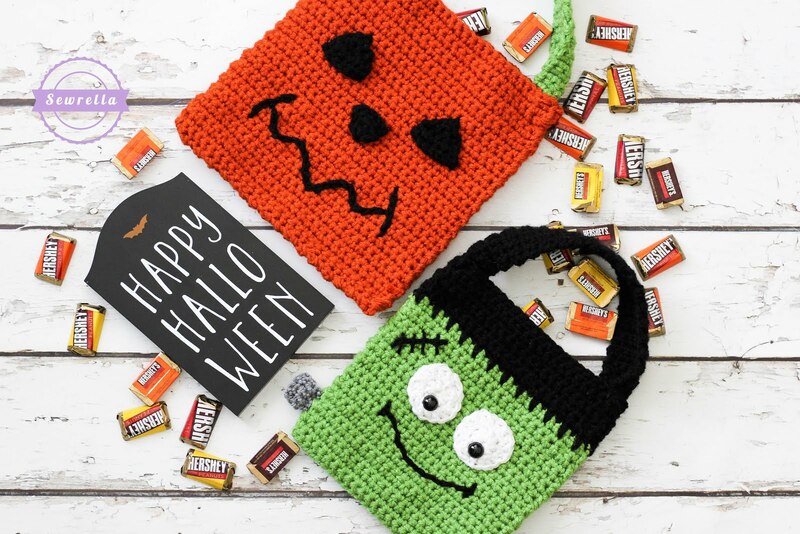 This bag is a bit smaller, for little hands or those who don’t want our youngins collecting enough candy to feed a small country, if you know what I mean. 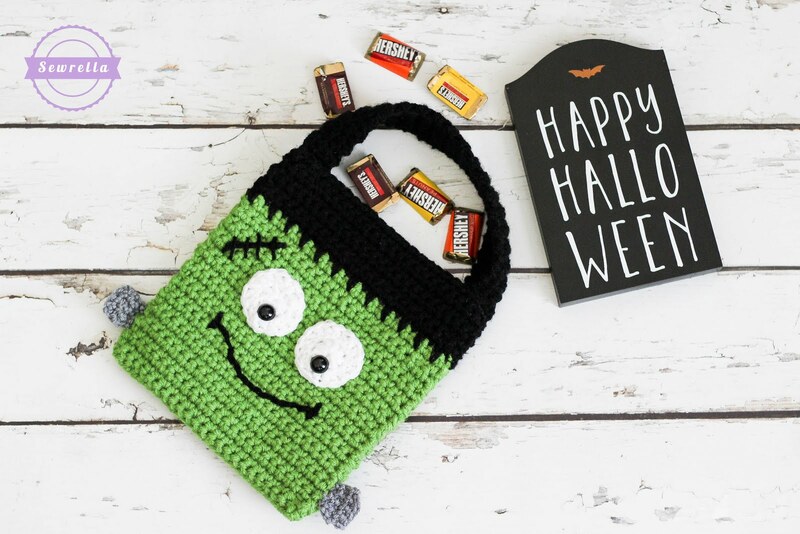 The sizing is modeled after the traditional jack-o-lantern candy bucket that we all carried as kids – not too big but not too small! However if you wanted to adjust the sizing of this bag, you could easily add or take away a few stitches from your starting chain and a few rows to the overall length of the bag. I also have a matching, slightly larger Pumpkin Trick-or-Treat Bag Pattern HERE! I am using Lion Brand Vanna’s Choice yarn for this project and it creates the softest feel while still being so sturdy! I’ve teamed up with Lion Brand to package this project up into a kit, complete with a FREE PDF download of the pattern and 20% off the yarn needed for the project! CLICK HERE to take advantage of this awesome kit before the sale ends! I hope you all have a happy, safe Halloween full of not-so-scary fun! 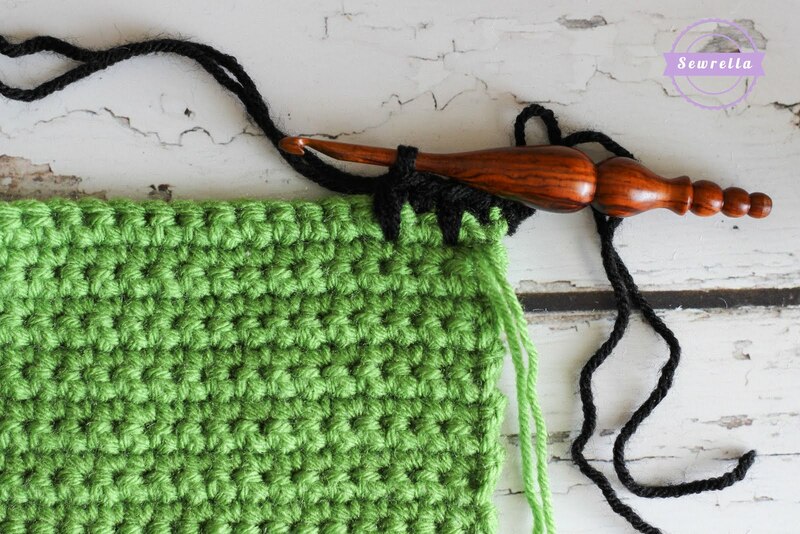 – Thread a large tapestry needle with a piece of fern yarn, whip stitch the front and back of the bag together only over Rows 1-25 of the bag. 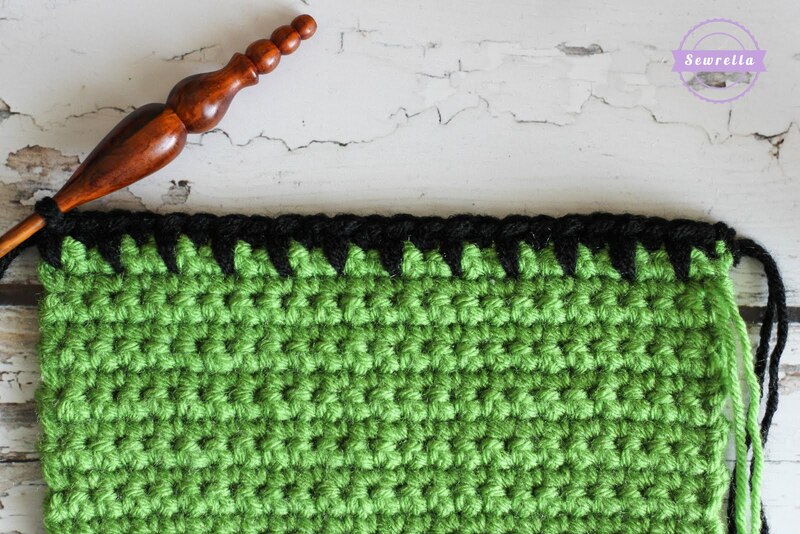 Switch to black to sew up the sides of Rows 26-32 of the bag. Weave ends. 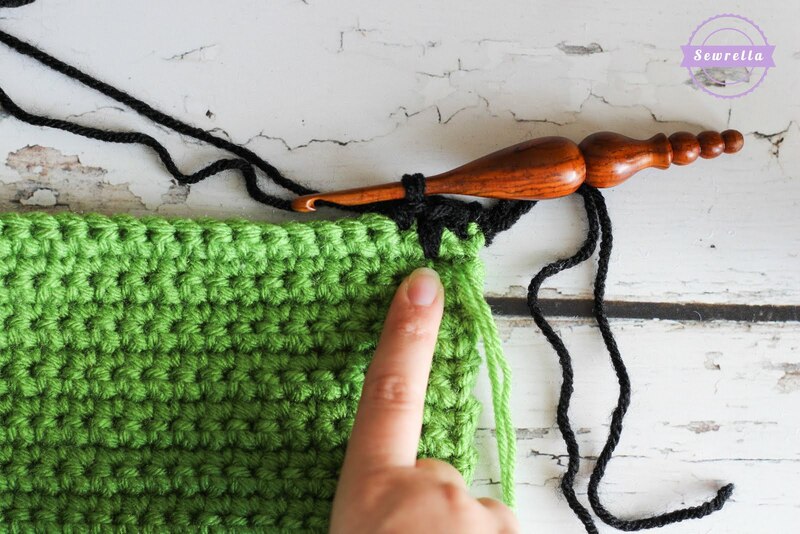 – Thread a large tapestry needle with a piece of black yarn, sew each end of the strap to the inside of the bag corner. Weave ends. – Sew bolts onto sides of the bag (I lined mine up with Rows 3-6). Weave ends.